Clandestine military projects are not unusual, especially when they concern technological advancements in weaponry and intelligence: countries, after all, want to keep their plans secret, both to surprise and surpass the capabilities of competing nations. The fabled Aurora project is one such military undertaking. 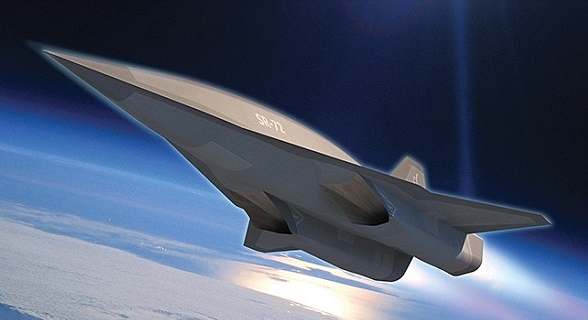 Aurora is the name of a reconnaissance aircraft (or perhaps the larger project surrounding the plane’s construction), which the United States allegedly began developing in the 1980s. Plenty of circumstantial evidence exists to support the reality of Aurora, but nothing conclusive – it remains wrapped in a shroud of mystery, which undoubtedly was the intention all along. GV2 patterns its new men’s Aurora watch collection on this legendary aircraft. The watch captures the essence of the phantom plane with its stealthy black-on-black exterior. Each of the watches is cast in a sizeable 45 mm, 316L stainless steel case and coated with black IP; the solid caseback features an engraving of the aircraft based on a familiar conceptualization. In keeping with the spectral theme, the central area of the Aurora’s black dial includes a semitransparent screen; beneath the screen, the entire bilingual (English and German) day wheel and the numerical date wheel are visible. 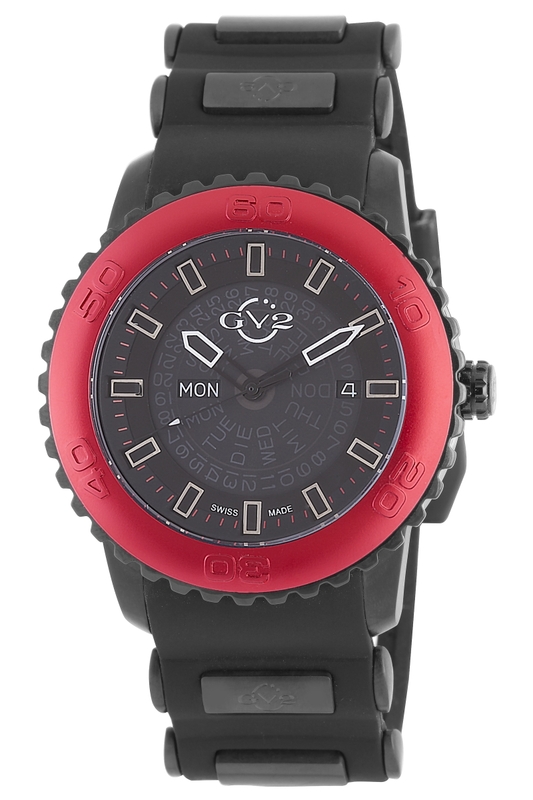 The current day and date appear in apertures on the left and right sides of the dial, and the GV2 logo is printed directly onto the crystal below 12 o’clock. The hands have white luminous tips and the hour indexes are silver, allowing the dial to fly under the radar without being awkwardly invisible. The notable difference between the watches in the collection is the color of the aluminum unidirectional bezels. 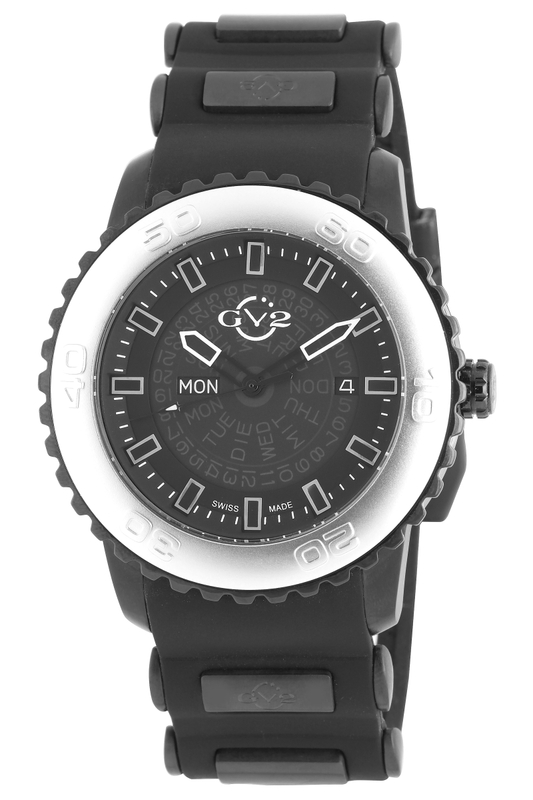 For the complete black-on-black look, opt for the model with the black bezel. There is also a silver-color bezel for those who prefer something tonal and bright, and for those looking for a splash of color there are bezels in red, blue, orange or green. On the colored bezel models, the minute indexes at the outer rim of the dial match the color of the bezel; on the models with black and silver bezels, these indexes are silver. 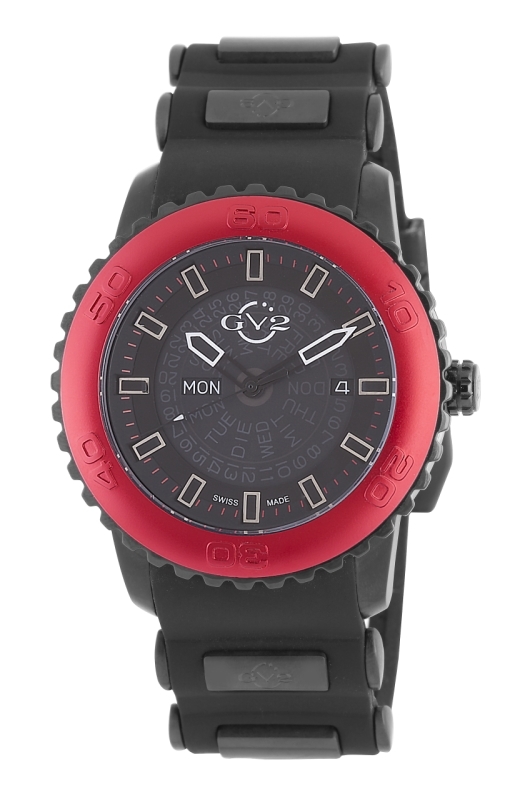 A black silicone strap comes mounted on every model. It features two spiny vertebrae at each lug end and levels out towards the inscribed buckle. Aurora watches are Swiss made and contain Ronda 517 Swiss quartz movements. Each utilizes an anti reflective sapphire crystal and is water resistant to 330 feet. Each variation is manufactured in a limited edition and comes in a special presentation box. Given the advancements in technology between the ’80s and today, there is every reason to believe that the Aurora aircraft – or its equivalent – exists, and the military is no less determined to keep it a secret. 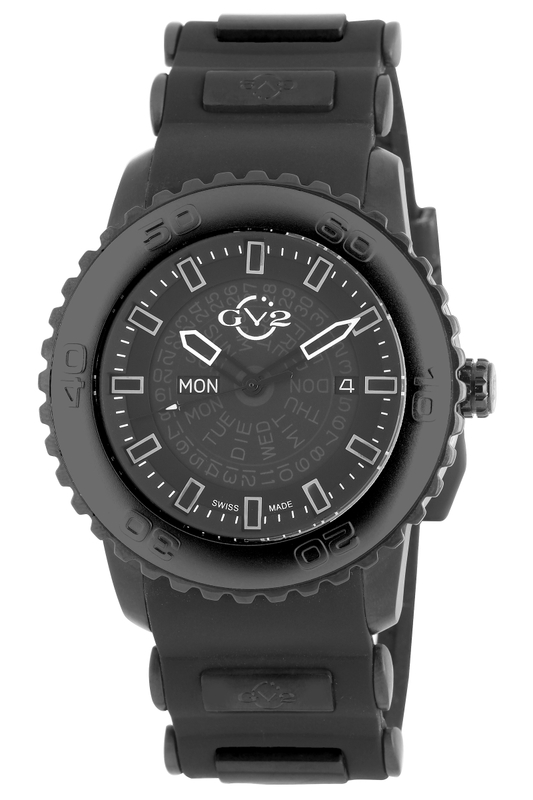 But adding one of these stealthy instruments to your watch collection is completely in reach: the only thing that won’t go undetected is your sense of style. Contact an authorized GV2 dealer today and pick your favorite. Gevril Group is the sole worldwide agent for GV2 Watches. Contact us by email or call 845-425-9882.